Bioroids and Bombots: Mini-mores and Flying Claymores. 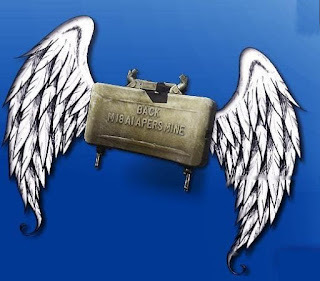 The Mini-more is the late 21st century version of the Vietnam war-era Claymore mine. Improvements in explosives formulation and technology have resulted in a weapon that is lighter and less bulky without any reduction in effect. The focussing of the blast force is better controlled, resulting in a reduced backblast area. Use the profile for a standard Claymore in High Tech 4e p.189 but reduce the weight to that given below and make the backblast range 5 yards. Even beyond this distance it will be dangerous and unpleasant to stand too close! A Mini-more is the size and shape of a typical paperback novel so will fit within most pockets or equipment pouches. It weighs 1.2lb. The resemblance to a book is increased by the presence of a hinged plate that resembles a book cover. This plate can be locked at various angles and serves as a stand for the mine. The plate is skeletonised providing numerous openings by which the stand can be nailed, screwed or tied into position. Older versions of the mine also have an adhesive pad on the mounting plate. This used a glue similar to that used on adhesive rodent traps, allowing the mine to be stuck to a variety of surfaces and removed again if not used. More modern versions use the same biomimetic sucker cups or NewtGlu utilized by smaller limpet mines (THS 3e p.159, Under Pressure 3e p.115). The mounting plate has a range of movement exceeding 180 degrees, allowing the mine to be used as a door-breeching charge or limpet mine. Vehicles sometimes mount the mines on armoured plates with the charge facing outwards for local defence. Mini-mores may be command-detonated by radio signal or fibre-optic hardline. The latter resembles monofilament fishing line and is less susceptible to jamming countermeasures that radio signals or conventional wire. Mines may also be triggered by a variety of plug-in sensor modules such as motion detectors or “tripwire” lasers. A long-life battery and small solar panel keep the mine’s electrical systems charged. The lower weight and size of the Mini-more has led to new tactical applications. A Mini-more may be carried by relatively small UAVs or ground robots. The “flying (or crawling) claymore” can stealthily approach a target, using terrain features as cover and concealment and accessing building through small openings. Grigori: Watchers in the Heavens.